When I was a kid, I hated cherries, except when they were in a Shirley Temple because I was and still am, addicted to those. I never ate the cherry Starbursts or sucked on cherry cough drops, if it was cherry, it wasn’t going near my mouth. Now, however, is a different story, I actually love cherries, whether it’s the real thing or it’s artificially flavored… I love them! 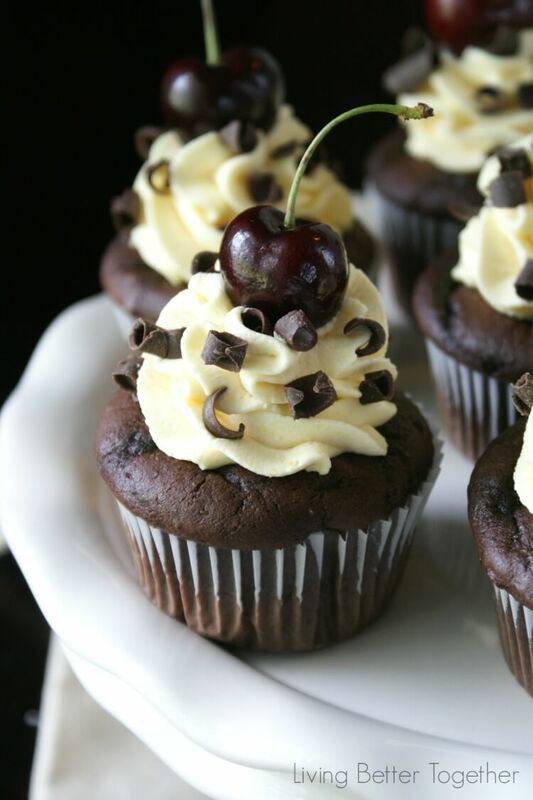 I happened to have a dozen cupcakes left over a couple of weeks ago and was trying to come up with a good flavor to make them… Black Forest Cupcakes just seemed like a natural choice! 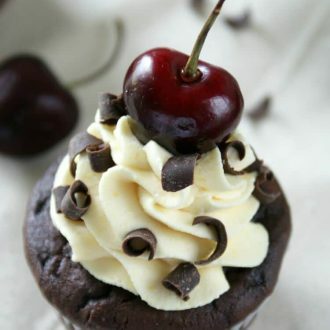 Black Forest Cake originated in Germany and is a chocolate cake with cherries and whipped cream and chocolate shavings. Sounds pretty amazing, right? The name is actually derived from a regional liqueur that is commonly found in the recipe… unfortunately there’s no alcohol in this recipe… but there’s lots of sugar! Hopefully that helps make up for it! If you want a cupcake made with liqueur, you can swing by and grab the recipe for my Island Daiquiri Cupcakes! 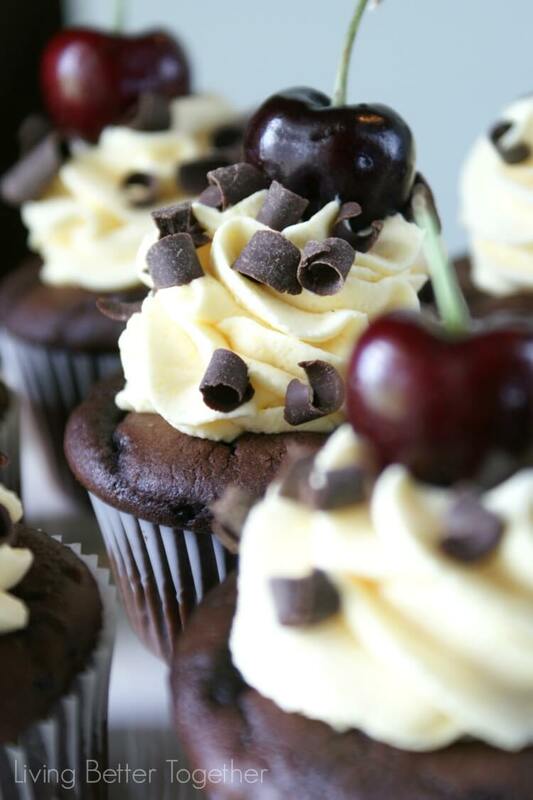 There’s just something about the sweet combination of black cherries and dark chocolate. It’s sophisticated, yet still fun, almost like an evening cupcake! Yup, I think that’s right, these would be the perfect cupcakes to serve at a cocktail party, they’re just so pretty and they’re filled giving them just a tad of mystery. These cupcakes are starting to sound like a bond girl aren’t they… if only I’d worked that liqueur in there, huh? Though these cupcakes might look difficult to make, they’re far from it. I used a store bought cherry ice cream topping (I like Breyers) to fill the cupcakes. 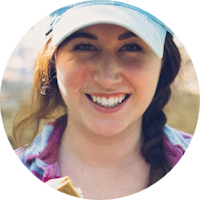 This meant a minimal amount of work without sacrificing great flavor and texture! Pair that with the extremely moist and rich adapted box mix cake and we’re looking pretty good without breaking the bank. But we’re not done there, finish these off with a simple vanilla whipped cream frosting, some chocolate shavings, and a fresh Black Cherry and we’re in business. And when I say in business, I mean heaven. Love cherries? Love Chocolate? How about a little Vanilla? 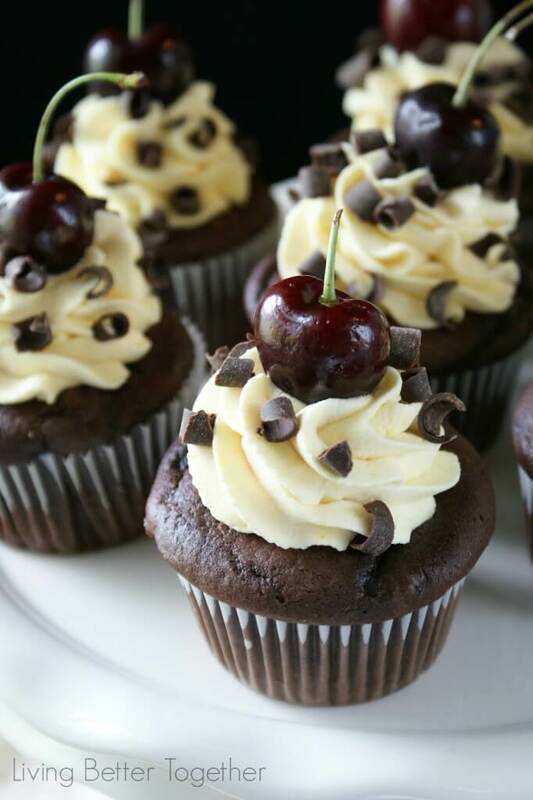 Well then, you're going to go gaga over these Black Forest Cupcakes! Fresh Black Cherries or Maraschino Cherries will work too. Combine all cupcake ingredients in a large stand mixer or bowl and beat until smooth. Add about 2 tbsp of batter to each liner, filling to about 1/2 - 3/4 full. Bake for 18-20 minutes or until fork comes clean. Remove and let cool, cook other batch. Clean your mixing bowl and add frosting ingredients to it, beat on medium speed until frosting becomes light and fluffy, about 2-3 minutes. Core out cooled cupcakes and add about a tbsp of cherry topping to each cupcakes. Pipe on vanilla frosting over the filling hole and around the rest of the cupcake. 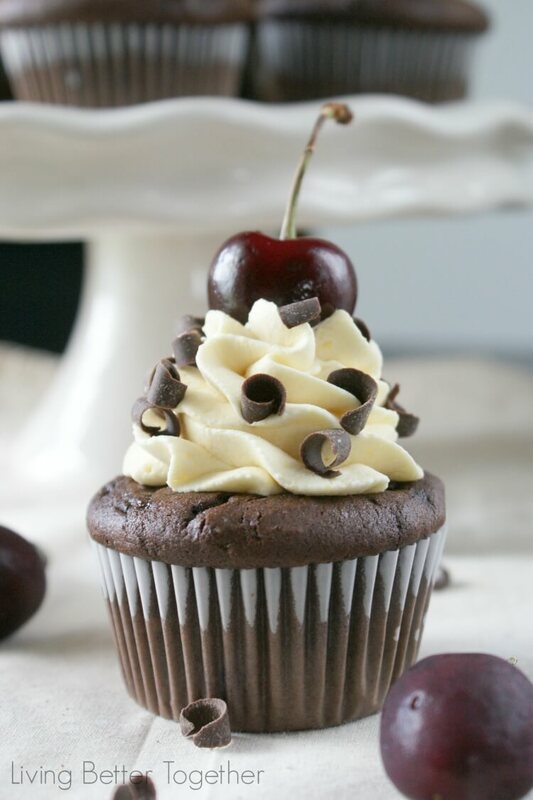 Top with chocolate shavings and a fresh black cherry. I thought I’d share a little behind the scenes with you guys today. Shoester is always at my baking side, whether it’s waiting something sweet to drop in the kitchen or guarding the photo shoot, he’s there. 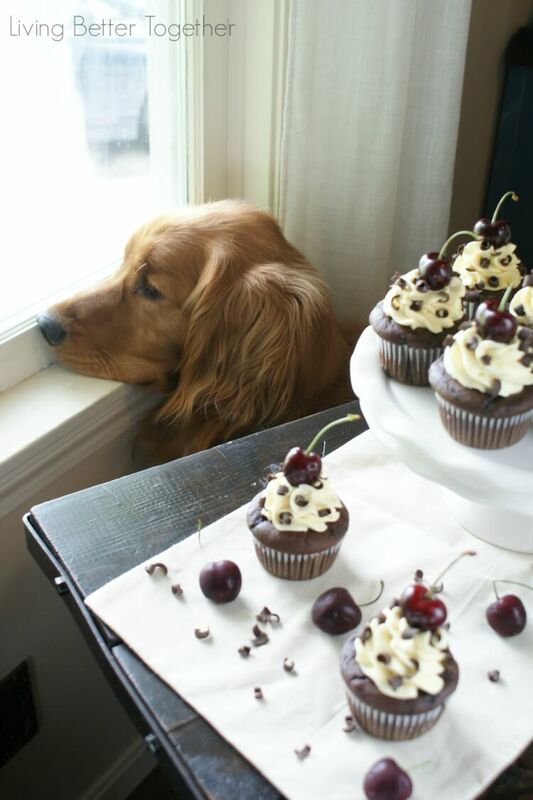 I hope you enjoy these cupcakes as much as I’ve enjoyed having you here and as much as Shoester enjoys when a dollop of whipped cream hits the floor. This looks decadent but delicious! 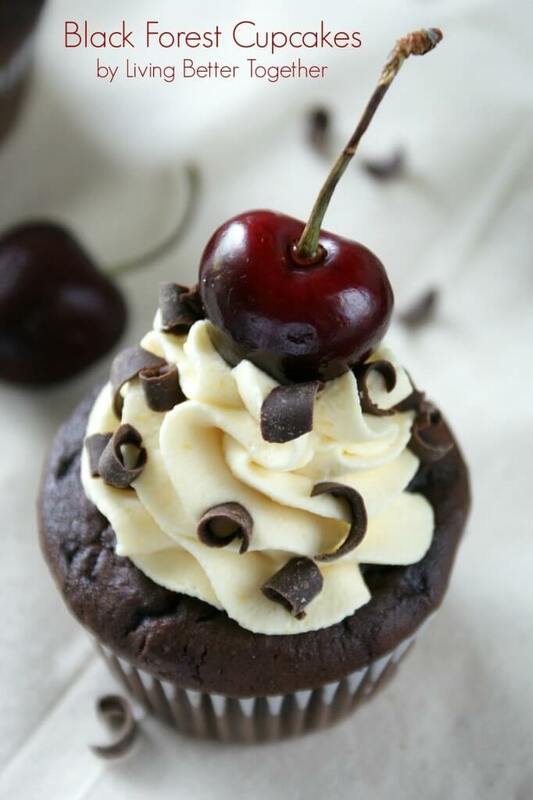 I love chocolate and cherries and the vanilla icing is perfect…thanks for sharing! Thanks so much for stopping by, I hope you get the chance to try them soon! Thanks, Julie! You’re the best! love chocolate and cherry. they look great! Thank you so much, Dina! It’s a great combination isn’t it? These little beauties are masterfully done! Very nice job. Thank you, Dan! They were quite delicious! Thank you, Crystelle! They were so good!